People are living longer lives than ever before due largely to better nutrition and health care. Specifically, life expectancy in the United States is estimated to be 81 years in women and 76 years in men,1 representing an increase by as much as 12 years over the past 50 years.2 Despite this impressive feat of our health care, the rate of age-related diseases such as Alzheimer's disease also has increased, becoming the sixth leading cause of death.3 Thus, a common goal for geriatricians and the aging population is to better understand how we can keep intact the mental abilities of older adults. One popular adage that has guided recommendations to older adults is "use it or lose it," meaning that one must continually engage in and practice an ability or risk losing it. Practicing a physical skill such as basketball or golf clearly leads to improved performance. But does this adage apply to mental abilities as well? Use It or Lose It: Myth or Fact? One reason these brain-training games might be problematic is that they focus on specific skills in those games. As a result, those skills are not likely to generalize to specific "untrained" skills ignored by the games, nor to everyday tasks.6 Rather than training a specific ability, a more promising approach might be to engage in an everyday task that is complex and therefore utilizes many basic mental processes. These broad types of engagement might not only enhance multiple mental processes but also generalize to other everyday tasks. A second reason for the brain-training failures might be a lack of novelty and flexibility. The number of different games within each program is limited, leading to boredom or quick mastery, which in turn might lower their potential effectiveness. Assuming that boredom or quick mastery does not occur, older adults are still largely on their own to learn the games, motivate themselves to continue playing the games, and advance to new levels. To reach their potential, some older adults might need more guidance, hands-on training, and feedback. Without these aids, older adults might lose interest and stop playing. 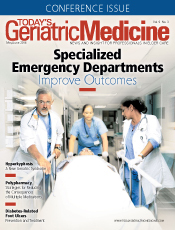 Thus, while the "use it or lose it" adage may have merits, people have taken it as truth without the necessary scientific evidence to appropriately inform geriatricians or the aging population. The Synapse Project has recently sought to test a new model of cognitive engagement that might overcome some of the limitations of brain-training games.7 In the Synapse Project, more than 200 older adults were randomly assigned to high- or low- challenge engagement groups. Some older adults learned a new skill such as digital photography or quilting, while others were assigned to groups that did not require learning a new skill, such as engaging in social meetings or solitary activities such as solving crossword puzzles. One of the critical requirements for the skill-learning groups was that the individuals had to be novices in that skill to enter the program. The program was set up like a continuing education program; participants engaged in structured learning about 15 hours per week and were assigned projects of increasing difficulty throughout the program. Before and after the 14-week program, the participants were tested on various mental abilities including processing speed, episodic memory, and reasoning. The key finding was that older adults who learned a new skill showed large improvements in episodic memory ability, and subtle improvements in processing speed and reasoning abilities relative to the group who socialized or engaged in solitary activities. While the digital photography group showed the greatest gains, gains also were found in the quilting group, suggesting that the exact activity did not matter. Furthermore, the tasks in which the participants engaged during the intervention were very different from the tasks that were used to assess their mental abilities. This difference suggests that the skills learned during the program generalized to new tasks—a problem with the brain-training games. Supporting these findings, a follow-up study trained a group of older adults to use a computer tablet for 15 hours per week over a 12-week period.8 As with the former study, participants were required to learn a new skill, having had little or no prior experience. Throughout the program, the older adults were taught how to use the tablet, and each week they were presented with a different theme of activities. For instance, one theme was Connectivity and Social Networking, where they learned how to use Twitter and Facebook, upload photos, and play games that use social networks as platforms, such as Words with Friends (a variant of Scrabble). Another theme was Health and Finance, where participants learned to use apps that provided health information and allowed them to track different types of finances. In this study, older adults also were tested on mental abilities before and after the program. Following the intervention, participants showed large gains in memory and speed abilities, just as in the original Synapse Project. In the Synapse Project, a subset of older adults received brain scans before and after the intervention.9 The motivation for doing so was that such broad engagement might enhance a variety of mental abilities, and brain imaging might help the researchers understand the specific pathways that were enhanced. Following the intervention, older adults showed enhanced brain activity in a frontal-parietal brain network involved in paying attention and problem solving. Those individuals who had the largest brain gains also were the ones who spent the most time on their projects and showed the greatest benefits in memory performance. However, the brain gains started showing declines one year after the intervention. These findings have three important implications. First, they suggest that the reason for the improvements in memory was likely due to enhancements in attention, which is a key component of storing and retrieving information. Second, the brain network showing enhancements overlapped with a network that is known to decline in old age, suggesting that broad level engagement may have partially restored brain activity to a younger state. Lastly, when older adults stopped the program, the brain gains slowly started to return to their original state, suggesting that continued engagement in novel activities might be necessary to maintain the brain enhancements. What Does the Synapse Project Teach Us? Cognitive engagement can help maintain cognition in older adults, supporting the "use it or lose it" notion, but how it is applied matters. • The type of activity matters. Learning skills benefited older adults more than solving crossword puzzles and socializing. In the digital photography group, participants were asked to learn how to operate a computer, use advanced software to edit photos, and learn the functions of all the controls on a digital camera. Learning these skills required paying close attention to the instructor, memorizing specific operations and how to perform them, and figuring out the next artistic shot. Furthermore, all of these skills were put to the test repeatedly as they were assigned new projects. For this reason, while taking a continuing education class to learn a new domain of knowledge can be fun, gaining knowledge in a new content area may not be as beneficial to basic mental abilities as is learning a new skill. • Novelty matters. The activities focused on skills that were novel to the participants in the study. This novelty helped create an effortful learning environment that required older adults to expend large degrees of mental energy, sustain focused attention (as evidenced by the brain findings), and strengthen skills that were rusty. The idea here is that if a task becomes too familiar, it will become more routine and automatic, and therefore use less of their mental abilities, including attention. For instance, driving a car was very difficult when we first got into the driver's seat. We pressed the brake too hard and we had difficulty paying attention to everything around us (all while listening to family or friends instruct us as they held tight with frightened expressions on their faces). Eventually, driving became so fluent that we barely needed to focus our attention on the road, and even learned to eat while listening with ease to music and family. It is at this point that the same mental abilities are no longer being used and a new skill must be learned. Unfortunately, as people age they encounter fewer of these novel opportunities and are more likely to form regular and familiar routines.10 This combination of fewer novel life experiences and more routinized schedules prevents the strengthening and facilitation of some abilities, especially after retirement. Thus, older adults have to go out of their way to experience novel and challenging activities. • Having an instructor matters. The activities were guided by an instructor. Learning a new skill can be frustrating and difficult. Learning a new skill is even more difficult when one attempts to learn alone. With an instructor these problems were minimized by starting slowly and learning basic skills. Then as the participants mastered the basic skills, they gradually learned more advanced skills. This gradual learning experience created scaffolds of knowledge that were reinforced with the hands-on help from the instructor to ensure that everyone received the assistance they needed. Together the proper timing and feedback can enhance motivation and help achieve higher mastery of the skill. • Sustained challenge matters. While the Synapse Project showed enhanced cognition and brain function by the end of the program, the benefits began to return to their starting point after one year. While studies need to be conducted to test the long-term effects of such programs, these findings suggest that continued exposure to novel and challenging environments is necessary to maintain cognitive and brain benefits. One of the tricks, as previously alluded to, is that older adults need to continuously maintain an awareness of new opportunities, especially once the current set of activities becomes familiar. Thus, the best habit to form is the habit of finding new challenging activities in which to become involved. Can Learning Novel Skills Delay Dementia? The truth is we don't know whether learning novel skills can delay dementia. Correlational studies have linked self-reported cognitive engagement with a decreased risk of developing Alzheimer's disease11 and a decreased accumulation of beta-amyloid, a precursor of Alzheimer's disease.12 However, controlled intervention studies like the Synapse Project have not yet been conducted to causally test whether challenging cognitive engagement leads to a delay or prevention of dementia. Nevertheless, the Synapse Project suggests that learning novel and challenging skills might be neuroprotective and should be recommended as a type of lifestyle change along with increases in exercise and a reduction of cardiovascular risk factors to prevent the onset of dementia. Evidence from studies like the Synapse Project suggests that the popular "use it or lose it" adage does apply to mental abilities when applied in key ways. — Ian M. McDonough, PhD, is an assistant professor at the University of Alabama and an associate of the Alabama Research Institute on Aging. His research focuses on memory and the development of behavioral and brain markers to understand and predict healthy and pathological aging. 2. Life tables. Center for Disease Control and Prevention website. http://www.cdc.gov/nchs/products/life_tables.htm. Updated December 8, 2015. 3. Alzheimer's Association. 2015 Alzheimer's disease facts and figures. http://www.alz.org/facts/downloads/facts_figures_2015.pdf. Published 2015. 4. Boyke J, Driemeyer J, Gaser C, Büchel C, May A. Training-induced brain structure changes in the elderly. J Neurosci. 2008;28(28):7031-7035. 5. Salthouse TA. Mental exercise and mental aging: evaluating the validity of the 'use it or lose it' hypothesis. Perspect Psychol Sci. 2006;1(1):68-87. 6. Ball K, Berch DB, Helmers KF, et al. Effects of cognitive training interventions with older adults: a randomized controlled trial. JAMA. 2002;288(18):2271-2281. 7. Park DC, Lodi-Smith J, Drew L, et al. The impact of sustained engagement on cognitive function in older adults: the Synapse Project. Psychol Sci. 2014;25(1):103-112. 8. Chan MY, Haber S, Drew LM, Park DC. Training older adults to use tablet computers: does it enhance cognitive function? [published online June 13, 2014]. Gerontologist. pii: #gnu057. 9. McDonough IM, Haber S, Bischof GN, Park DC. The Synapse Project: engagement in mentally challenging activities enhances neural efficiency. Restor Neurol Neurosci. 2015;33(6):865-882. 10. Martin M, Park DC. The Martin and Park Environmental Demands (MPED) Questionnaire: psychometric properties of a brief instrument to measure self-reported environmental demands. Aging Clin Exp Res. 2003;15(1):77-82. 11. Wilson RS, Mendes De Leon CF, Barnes LL, et al. Participation in cognitively stimulating activities and risk of incident Alzheimer disease. JAMA. 2002;287(6):742-748. 12. Landau SM, Marks SM, Mormino EC, et al. Association of lifetime cognitive engagement and low β-amyloid deposition. Arch Neurol. 2012;69(5):623-629.